“Friending” a judge on Facebook, Unpublished (but citeable) case on constructive trust for life insurance. Recorded conversation, Sanctions for disclosing confidential information in custody case, Disqualification of counsel request, Uniform Fraudulent Transfer Act and premarital agreement, Exercise of stock options and child support, relocation action and more. Legislative study committee on equal placement. Jeff Bezo’s divorce and how a bitter divorce help derail a $70m project. Lump sum payment of arrears as deductible alimony. Yes, it’s been a while. In fact, believe it or not, before this week, the last published court of appeals decision in family law was April 19, 2018. That’s almost a year. Yikes. While avoiding litigation is good for clients, it’s nice to have some authority from the courts to convince clients to accept the compromises necessary for settlement. The new case is not a big help in that regard, but it does make for interesting reading. 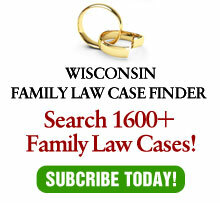 For more, watch this month’s video below and my future columns in Wisconsin Law Journal . This month I discuss the WI Court of Appeals decision in Miller vs. Carroll, which deals with the perceived impropriety of a lawyer being friends with a judge on Facebook. On October 24, 2017, the District III Court of Appeals issued their opinion in Miller v. Carroll, No. 2017AP2132, which reversed and remanded with directions the orders rendered by the Honorable Michael J. Bitney (Barron County), filed February 20, 2019. Timothy Miller appealed an order modifying custody and physical placement of the parties son and establishing child support. After trial, which went in favor of the mother, Angela Carroll, the trial judge accepted a facebook “friend” request from Angela. This was not disclosed to Timothy or his counsel. Between the time that Angela and the judge became “friends”, Angela “liked” eighteen of the judge’s posts and commented on two of them, although none were related to the litigation. During this time frame, Angela “liked” and “shared” posts related to domestic violence, which was an issue in the litigation. After Timothy learned of the facebook relationship, he moved for reconsideration of the court’s decision. The court denied the motion, stating that he was not biased and had decided prior to the relationship how he was going to rule, although he had not put his ruling into writing yet. The court of appeals reversed. While not establishing a bright line, the appellate court held that Judge Bitney’s actions “created a great risk of actual bias, resulting in the appearance of partiality.” Accepting Angela’s friend request conveyed the impression that she was in a “special position to influence the judge’s decision, a position not available to individuals whom he had not “friended, such as Timothy. The risk of bias and appearance of partiality was heightened because the connection was not disclosed to any of the parties or attorneys in the case. Finally, Angela’s sending a “friend” request to the judges during litigation raises ex parte communication concerns, which can erode public confidence and create the appearance of partiality. As a result, the appellate court reversed and remanded with directions that the case proceed before a difference judge. On February 27, 2019 the District II Court of Appeals issued their opinion in Pulkkila v. Pulkkila, No. 2018AP712, which reversed the order rendered by the Honorable Paul Bugenhagen (Waukesha County). In 2009, James committed in an MSA to keep a $250,000 life insurance policy in effect with his children as beneficiaries until they reached adulthood. In 2014, while still having at least one minor child, he changed the beneficiary designation to his new wife and then died a year later. Although the former wife, Joan, was entitled to a lien against James’ estate, but his estate was worth $5,600. Joan requested a constructive trust on behalf of the children, which the trial court denied. She appealed and the Court of Appeals reversed. The appellate court held that the equities of the case mandate the creation of a constructive trust in favor of the children in order to accomplish the intent of the MSA. James’ intent does not matter as his designation of his new wife as beneficiary was wrong and inequitable under the terms of the MSA. Also, the remedy of a lien against the estate is unjust and not a viable remedy. Please Note: Some decisions are posted in Adobe Acrobat (PDF) format. Marsh v. Curran, et al. Timothy Marsh sued his wife’s attorneys for allegedly recording his conversations with his attorneys and with his alleged paramour, and using the contents of those recordings in the divorce proceedings. The district court held there is no absolute immunity shielding the attorneys use of the recordings in the litigation. Lakeya P. v. Ajja M.
Although the trial court’s finding that extraordinary circumstances existed such that it was in the children’s best interest to award custody of the two youngest children to their aunt and the two oldest children to their great aunt rather than to their mother was supported and would not be overturned, the trial court erred impermissibly abdicated its responsibility to ensure that mother had frequent and regular access to the children by delegating to aunt and great aunt its authority to set supervised visitation schedule. 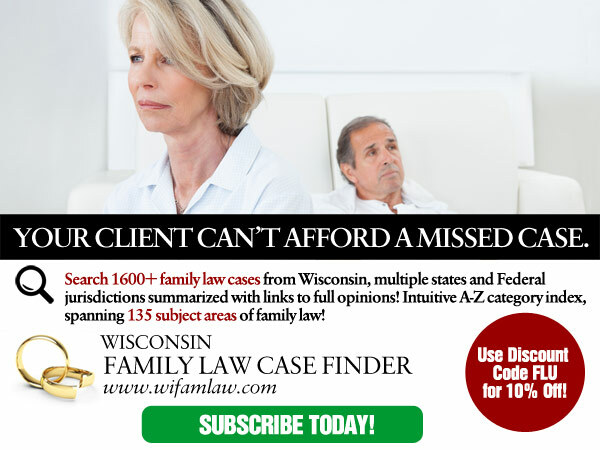 In a post-dissolution proceeding, the former husband moved for sanctions against the former wife and her attorney for their disclosure of information contained in the confidential child custody report in the former wife’s dissolution proceeding from her current husband. The Superior Court granted motion and ordered former wife and her attorney to pay jointly and severally a fine of $50,000. The Court of Appeal held: (1) information in the report fell within the protection of the confidentiality statute governing such reports; (2) the attorney’s deposition questions constituted disclosure of confidential information contained in the report; (3) the court reporter, videographer, and current husband’s attorneys were all unauthorized to receive disclosures of confidential information contained in the report; (4) the evidence demonstrated that the attorney’s disclosure was intentional and not in the best interests of the child, so as to warrant sanctions; (5) the trial court’s findings supporting the sanctions award were sufficient to satisfy due process; (6) a $50,000 fine was not constitutionally excessive; but (7) the former wife was not jointly and severally liable for the fine. The parties sought construction of the property settlement agreement. The disputed portion of the agreement provides that defendant husband “will pay 100% of the … tuition, room, board and books for both children until they complete the degree they are currently in and so long as they are in a full time program or until such time as they reach the age of  years, which ever comes first.” At the time of the agreement’s execution, the eldest daughter had completed her undergraduate degree and was enrolled in a graduate program. The court rejected the husband’s contention that the agreement’s language obligated him to pay only for the eldest daughter’s graduate program, not her outstanding undergraduate debt. As the court properly concluded, the plain language of the agreement reflects defendant’s undertaking to pay for all—i.e., “100%”—of his children’s educational expenses through and including—i.e., “until”—the completion of the program in which they were “currently” enrolled. Such expenses necessarily include the undergraduate debt incurred by the eldest daughter. Husband’s consultation with counsel, who subsequently represented wife in divorce action with husband, regarding distribution of homeowners’ insurance check was not reasonably probable to have provided confidential information to counsel that would have prejudiced husband in divorce action, and thus counsel was not disqualified from representing wife under rule governing counsel duties to former clients, although wife sought counsel fees in divorce action, where husband’s consultation did not bring up his financial circumstances as relevant in divorce action. The Uniform Fraudulent Transfer Act (UFTA) can apply to premarital agreements in which the prospective spouses agree that each spouse’s earnings, income, and property acquired during marriage will be that spouse’s separate property. Trial court acted within its discretion in including former husband’s gains from exercise of stock options as part of his gross income for purposes of calculating alimony payments, though former husband asserted that stock options were not regular source of income and that brokerage account had been assigned to him under terms of divorce decree. There was evidence indicating that former husband’s gains from exercise of stock options were a regular source of income, including that he regularly received stock options over the years as part of his compensation and had exercised those options, and there was no indication whether options at issue were awarded to him at time of divorce or in later years. Mother’s reason to leave the state was not contemplated to a sufficient degree to find that there was no material change of circumstances from the conditions that existed at the time the original joint custody order was entered, so as to preclude modification allowing mother to relocate; although mother and father both communicated prior to the original custody order the hypothetical possibility of moving should their then-existing relationships develop further, mother’s relationship had since resulted in a pregnancy, a marriage proposal, and a wedding. The Legislative Study Committee is voting on several proposals regarding modifications to placement and child support, mostly based on lobbying by groups pressuring for mandatory equal placement. To review this proposals and other information, cisit the 2018 Legislative Council Study Committee on Child Placement and Support web site. The following articles are provided for informational purposes only. If you discover an article on divorce or family law related issues that may be of interest to our subscribers, please e-mail me. The following is provided courtesy of Contributing Editor Scott B. Franklin, Certified Public Accountant and Attorney. You can reach Scott via e-mail. By now, everyone should be aware that for post-2018 divorces, alimony/spousal support/family support is no longer deductible. For pre-2019 divorces, the old rules continue to apply and tax court rulings will continue to apply them to various cases, such as Siegel v. Comm, TC Memo 2019-11, recently decided on February 14, 2019. In this case, the payor was apparently behind in his alimony payments and faced a court order to pay $250,000 of arrearages to his ex-wife (or go to jail), of which $225,000 was for alimony. The facts do not indicate why the IRS questioned the deduction (perhaps the ex-wife did not report the income and created a mismatch issue), but the IRS claimed that the lump sum was not alimony, but rather a non-deductible money judgment. The Tax Court reversed and affirmed that lump sum payments of family law arrearages maintain their character as alimony or child support. Even though New York Family Law allowed the Court to issue a money judgment in family court cases, this instant order was determined to be a contempt order and the payment was still considered alimony for federal tax purposes.